Jerry Renault ponders the question on the poster in his locker: Do I dare disturb the universe? Refusing to sell chocolates in the annual Trinity school fund-raiser may not seem like a radical thing to do. But when Jerry challenges a secret school society called The Vigils, his defiant act turns into an all-out war. Now the only question is: Who will survive? First published in 1974, Robert Cormier's groundbreaking novel, an unflinching portrait of corruption and cruelty, has become a modern classic. Robert Edmund Cormier (January 17, 1925–November 2, 2000) was an American author, columnist and reporter, known for his deeply pessimistic, downbeat literature. His most popular works include I Am the Cheese, After the First Death, We All Fall Down and The Chocolate War, all of which have won awards. 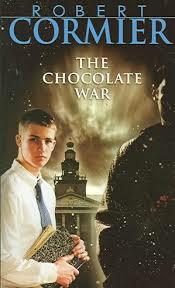 The Chocolate War was challenged in multiple libraries. His books often are concerned with themes such as abuse, mental illness, violence, revenge, betrayal and conspiracy. In most of his novels, the protagonists do not win. Για το βιβλίο στα αγγλικά εδώ.